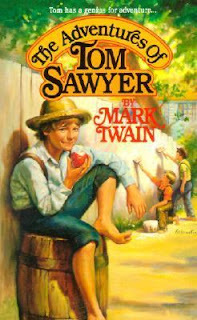 Saturday, June 12, 2010 is Tom Sawyer Day in Hartford, CT.
On the beautiful grounds of the Mark Twain House and Museum you can get a taste of Tom's boyhood adventures with free events organized just for kids and families from 10:00 a.m. to 5:00 p.m. Tours of the Twain House will be available for a fee - or check out our library's pass to the Mark Twain House and Museum and get a discount (available to Hamden residents with valid library cards). Tom Sawyer Day is part of Hartford's Magical History Tour, which also involves The Amistad Center for Art & Culture, and the Harriet Beecher Stowe Center. All three locations will have a full day of family activities, including games, music, crafts, theater, cake, and many, many more. There will be a free shuttle between the sites all day for maximum free fun for all ages.